GUI for Synergy2, a mouse/keyboard sharing tool. Is there a better alternative to QuickSynergy? Is QuickSynergy really the best app in Network category? Will QuickSynergy work good on macOS 10.13.4? 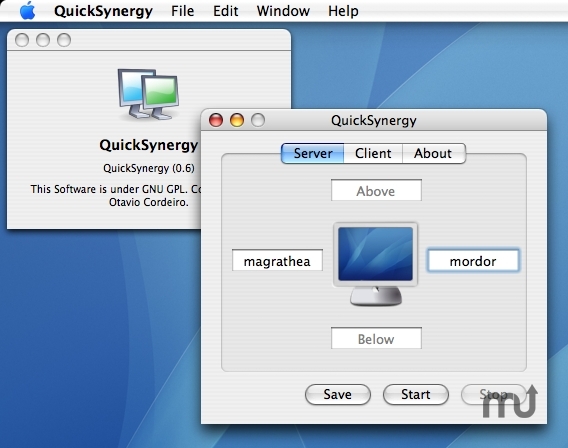 QuickSynergy is a graphical interface (GUI) for easily configuring Synergy2. Synergy2 is an application that allows the user to share his mouse and keyboard between two or more computers. This version of QuickSynergy includes Synergy2 binaries. Without the need for any external hardware, Synergy2 uses the TCP-IP protocol to share the resources, even between machines with diferent operating systems, such as Mac OS, Linux and Windows.